80 million teens and twenty-somethings are ready to make their mark on American politics. 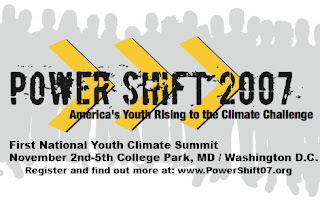 Is the growing youth climate movement - now poised to explode off campuses and into the nation's capitol for Power Shift 2007, the first national youth climate summit - the vanguard of a new progressive, pro-environment youth political movement? By 2010, another 17.3 million young Americans will come of age, swelling the already sizable ranks of voting-age "Millennials" – those teens and twenty-somethings coming to age in the early years of the 21st century. At 80 million strong, the Millennial generation outnumbers even the Baby Boomers by 3 million and represents the single-largest demographic age group in electoral politics, according to a recent Mother Jones article ("The 50-Year Strategy", in the Nov/Dec 2007 issue). Polling data, recent voter turnout, and the swelling ranks and increasing coordination of the youth climate movement all demonstrate that this young generation is remarkably engaged, overwhelmingly progressive and pro-environment, and has largely rejected the "government-is-the-problem" conservative mentality that still dominates the general population (see table below). 58% 32% agree that the federal government "is usually inefficient and wasteful"
52% 40% say regulating business "does more harm than good"
This young generation is razing the old stereotypes of the apathetic, unengaged youth that may have accurately characterized Generation Xers, as youth turnout in the past two elections hit the highest level in at least 20 years. And the Millennials aren't simply waiting for politicians to take notice and seemingly won't content themselves with limiting their impact to the ballot box. In fact, they're demanding to be noticed, as thousands get ready to storm our nation's capitol to flex some political muscle in the first-ever national youth climate summit, Power Shift 2007, and rally at nationwide Step it Up actions in November. According to www.PowerShift07.org, over 5,000 youth and students from across the country will soon explode off of campuses and converge on D.C. for Power Shift 2007, November 2nd-5th. With all 50 states represented, youth attending the conference will engage with solutions to global warming and learn how to effectively put solutions into practice as they cement the core of an increasingly sophisticated and coordinated nationwide youth climate movement. Power Shift's agenda includes issue briefings from leading scientists and policy experts, training sessions, an opportunities fair, and additional networking opportunities, all designed to connect young leaders and use their collective experience to focus action on America's greener, more prosperous future. That same weekend, tens of thousands more student and youth activists will join in hundreds of actions in their home communities as part of the second Step It Up nationwide day of action, Saturday, November 3rd (see www.StepItUp07.org). Founded and organized by a group of Middlebury College students, recent grads, and their mentor, Bill McKibbon, Step It Up successfully organized 1,400 actions across the U.S. involving hundreds of thousands of citizens in their first nationwide day of action, April 14th, 2007. Thanks largely to these highly visible and well-attended actions – which demanded Congress “step it up” and cut carbon emissions 80% by 2050 – virtually all of the 2008 Democratic candidates for president are chanting the 80x2050"mantra in their stump speeches these days and striving to out-compete each other for the meanest, greenest energy plan. Sponsorship and support is also building behind bills in Congress that would tackle the climate crisis and put the 80x2050 plan into action. This November, the young minds behind Step it Up 2 will be at it again, this time joined by the thousands of participants at Power Shift 2007 to demand real action to address the climate crisis and secure the future of today's youth. On Monday, November 5th, the youth at Power Shift will carry reports and pictures of the hundreds of Step It Up actions into the offices of their senators and representatives, as thousands of young people descend on Capitol Hill to make their voices heard. If the increasing coordination, sophistication and activism of the youth climate movement is any indication, the Millennial generation has arrived on the political scene, and they are sure to make their mark. "[The Millennial] generation is politically engaged, votes in high numbers, and leans overwhelmingly Democratic. ... But the millennials' impact will show up beyond the ballot box. Polling data indicate that they are unusually civic minded (they volunteer at the highest level recorded for youths in 40 years, according to one study) and hold a wide range of progressive values ... [they] even believe in government again (Sixty-three percent think government should do more to solve the nation's problems)." As the authors conclude, "This generation is poised to become the core of a 21st century progressive coalition." It's clearly time for today's politicians to start paying serious attention to the Millennials – especially candidates in the 2008 elections. According to Rosenberg and Leyden, if people under age 29 had been the only voters in the 2004 election, John Kerry would have won by a landslide with 372 electoral votes. And in the 2006 midterms, "the same age group went for Democrats over Republicans by 22 percent - an almost unheard-of margin." When thousands of young people take to the streets in Step it Up actions and head to D.C. for Power Shift in a couple of weeks, politicians would be wise to take note. If they don't, they just might find themselves looking for a new job, as millions of young voters throw their support behind more progressive, pro-environment candidates committed to ending the climate crisis and protecting the future of the Millennial generation. Power Shift is organized by the Energy Action Coalition (www.energyaction.org), an alliance of more than 40 organizations from across the United States and Canada, founded and led by youth to help support and strengthen the student and youth clean energy movement in North America. Energy Action Coalition groups have successfully launched campaigns on over 600 college and high school campuses through the Campus Climate Challenge and successfully won commitments from 400 college and university presidents to work towards complete climate neutrality at their institutions. The blog “It’s Getting Hot in Here” (www.ItsGettingHotInHere.org) is the Energy Action Coalition’s outlet for the voices of the growing youth movement on climate change, is regularly visited by tens of thousands of readers from across the globe. I just came to check out several of the different web blogs suggested by Its Getting Hot in Here. I have been follow several of the Eco-Events going on in the U.S this weekend like Powershift 2007 and Step It Up and am very impressed by the ambitious environmental efforts of the young adult community. I am a 24 year old currently working with a coalition to make online users more aware of www.energybill2007.org. This bill has the ability to reduce our dependence on foreign oil, create cheap, renewable energy, save taxpayers money, and create jobs all at the same time. Our latest efforts to getting Congress's attention can be viewed here:http://smnr.us/thespookytruth/. If you like our message, sign up! Thank you! !